Many mission-driven organisations design and deliver life-changing products to improve the lives of poor people in the developing world. Products such as solar lights that replace dirty burning kerosene, clean cookstoves that cut hazardous emissions and smoke, or drip irrigation systems that make growing crops year round possible, generate significant health, livelihood and convenience impacts for the world’s poor. But the twist is that instead of giving these products away, disadvantaged people buy them at affordable prices. The challenge is how to make all this happen. Thoughtful planning and effort has been put into how these products move from warehouse to the end users, often travelling over severely underdeveloped infrastructures. Knowing how to navigate this ‘last mile of distribution’ is important, but the most critical gap to close is the ‘last yard’ of the last mile - the transaction that must happen between seller and buyer. Organisations quickly come to the realisation that it is not the last mile that matters – it’s the last ‘yard’ of the last mile that makes all the difference. The product won’t sell itself in quantities enough to make a difference. Learning how to navigate the last yard of the last mile is where the difference is made. However, the challenge is how to do it. Unfortunately, most organisations feel pressure to get products out the door. They take a stab at setting up a sales function, but salespeople are mostly on their own to figure out how to sell. They employ product-led selling, which is blindly pitching the features and benefits of the product and trying to convince people to buy. There is little if any listening, no engagement with customers regarding the problem they need to solve, and certainly no exploration of the financial implications of having the problem. This is selling at its worst. It sets off a chain of events that produces fewer sales, which means lower commissions for salespeople who, in turn, experience greater pressure to make sales to earn money. This results in salespeople either quitting or inflicting pressure on prospects to buy, which can earn a well-meaning organisation a bad name and makes buying a miserable experience. Ironically, mission-driven organisations can end up recklessly sponsoring devious and unscrupulous sales practices. On the contrary, problem-led selling starts by exploring a potential buyer’s problem, which asks questions and listens closely to the answers. This skill awakens people to the dissatisfaction they have with their current situation. They begin to realise the impact of what they have been putting up with for a long time, such as the inconvenience and danger of defecating in the open, cooking over dangerous open fires, relying solely on rain to grow their crops, etc. Now, with a clear understanding of the problem and what it is costing them, customers suddenly become motivated to solve it. And if the solution presented by the seller matches the needs of the buyer, a wise purchase is made. The seller is happy, the buyer is happy, and ultimately, the desired change in behaviour happens. But this doesn’t happen by accident. Leaders of selling organisations need to set up their sales teams for success at problem-led selling. It requires thoughtful planning to formalise the sales strategy and the corresponding training curriculum. Sales managers must teach it to their sales teams and reinforce it, whether there are one or two members or hundreds, even thousands of salespeople. Continuous learning opportunities need to be designed and delivered on the job so that the skill is reinforced and the team’s capability develops over time. Setting up a successful selling function requires avoiding certain common mistakes. For instance, sales teams need to be of a size that one person can handle. As a general rule, sales teams should range from four to six people, but certainly no larger than eight, that is if you want to develop high performance and low turnover. The size of the team should be in direct proportion to the skill of the sales manager. The sales manager needs time with one on one time with each person, and not try to manage the team as a group. Another thing to avoid is automatically promoting the top sales person to sales manager because it is a very different skill than selling. Just because an individual is a top salesperson, there is no guarantee that he or she will be an effective sales manager. Regardless of who takes the role of sales manager, they need to be trained well and managed to do a good job. Selling life-changing products in the developing world is a relatively new pursuit, and its very effective in creating behaviour change. However, it must be initiated with a full commitment to building a professional, ethical selling function within the organisation. And especially with purpose-driven organisations, a problem-led approach is a perfect match that will deliver the mission. 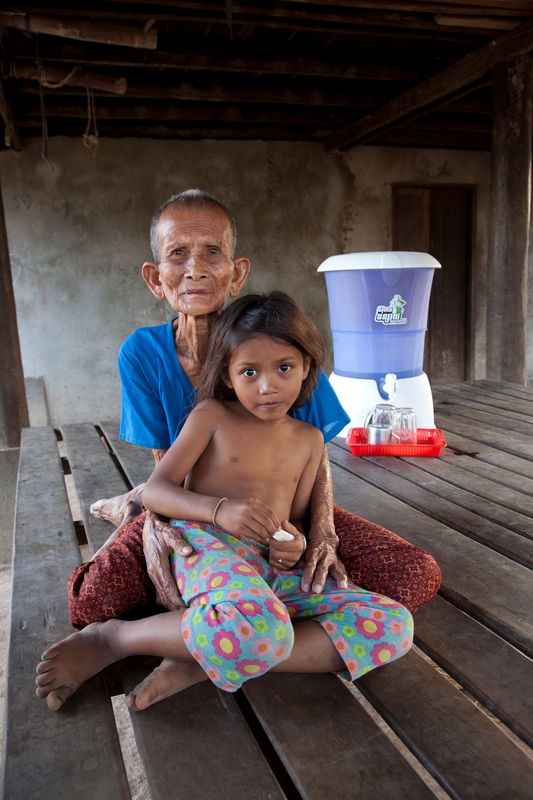 Hydrologic manufactures kiln-fired clay water filters to provide safe drinking water in Cambodia. The “Rabbit” water filter is a safe and effective household alternative to the labour-intensive and carbon-producing practice of boiling drinking water. One filter produces 30 litres of potable water every day, enough for a large Cambodian family. At first Hydrologic, supported by grants, sold most of its product stock to NGOs, which then distributed the products to the poor. Making a profit was not an early objective, and margins were razor thin. Yet it soon became evident that Hydrologic needed more profit to achieve sustainability, especially in the face of an inconsistent stream of grants. To increase profit Hydrologic needed more buyers. While initial orders rose by engaging retailers and wholesale distributors, it still failed to stimulate the market. Nobody was engaging the consumer or they only learned of the Rabbit filter by word of mouth. Clearly, Hydrologic could not drive demand with its retail strategy, nor could it grow by relying so heavily on NGOs. In 2011, we began to assist Hydrologic with developing a sales strategy. An initial discovery process determined that the way forward must be a more proactive campaign that offered an alternative to the common practice of boiling water and prompt a highly personal buying experience that would alter cultural norms. Recruiting a direct sales team to execute a below-the-line marketing strategy and sales campaign. Hydrologic might have to hire inexperienced people—but it could hire, train and nurture the right inexperienced people—ones with drive, determination, and a capacity and willingness to learn. All managers and sales personnel provided “right effort” inputs for a dashboard to measure performance. Data became a tool to drive improvement and generate sales that, when scaled, would be profitable. Every prospect was engaged personally through group presentations and systematic direct sales calls. This engagement—a problem-led sales conversation instead of a product pitch—stimulated action to buy and thus change longstanding behaviour. Creating momentum within each rural village by capitalising on relationships with communities and their leaders. Using names and testimonials were key to piquing consumer interest and overcoming fear and mistrust. Increasing prices to achieve profitability. It turned out that consumers were unfazed when prices were doubled. Margins grew alongside higher unit sales. Offering consumer financing as an option made it easier for buyers to spread the cost out over six months. Annual sales increases of 50% or better over pre-2014 levels have been maintained since the interventions began. Profitability was attained by mid-2014 as higher-margin, direct sales to consumers accounted for a growing proportion of total sales. By year-end 2016, Hydrologic had sold 480,000 units since the Rabbit filter was introduced. Header image: A Hydrologic sales meeting a village in Cambodia.